Artists Sketch Pads made from high quality 300 gsm & 350 gsm white Ruled paper available in different types and suitable for Art College & School use. Sparrow design firm brings the brand new visual reference that graphically appreciates the old art of product making. In retrospect being around these articles and having them as a part of our life inspire us to rekindle their design sensibility. We try to blow new life into these legendary designs by translating them in our contemporary graphic style. We call it TAN. Owing to the rich industry experience in this domain, we are involved in offering an extensive range of Sketch Book to our clients. We take pleasure to introduce ourselves as one of the renowned firms for providing the best-in-class range of Sketch Book. Our Drawing / Sketch Pad are made from high quality paper along with excellent binding ensures its longer life. We provide these to our clients in different sizes and colors. 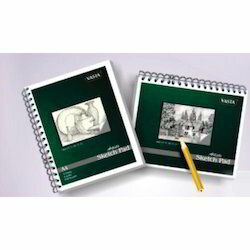 We offered these Sketch Pad to our clients at industrial leading prices. We are offering superior quality of Sketch Books / Pads in the A4 and A3 sizes with the packaging of 30 sheets and 100 sheets. These products widely use in various organization, which is available at completive prices. In this book you can see some good sketches of wild animals. You can learn to draw outline of the pictures with anatomical structural details and how to shade it with proper tonal values. 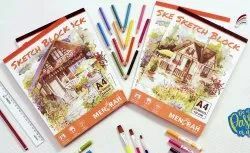 Backed by huge industry experience and market understanding, we are involved in offering a wide array of Drawing Sketchbook to our valued patrons. In order to meet various demands of our esteemed clients, we are engaged in manufacturing an optimum quality array of A3 Sketchbook. Foscari Sketch 100 gsm premium acid free ivory paper-plain/stitched binding, A 5 size, Suede-touch embossed leatherette, hard cover case bound with round corner. Thermography stamping, cover made of 1075 gsm board for extra support , expandable pocket for additional document storage, elastic closure & ribbon marker. Available in sizes A5, A6, B6.